Historical anthropology is a revision of the German philosophical anthropology under the influences of the French historical school of Annales and the Anglo-Saxon cultural anthropology. Cultural-historical psychology is a school of thought which emerged in the context of the Soviet revolution and deeply affected the disciplines of psychology and education in the 20th century. This book draws on these two schools to advance current scholarship in child and youth development and education. It also enters in dialogue with other relational approaches and suggests alternatives to mainstream western developmental theories and educational practices. This book emphasizes communication and semiotic processes as well as the use of artifacts, pictures and technologies in education and childhood development, placing a special focus on active subjectivity, historicity and performativity. Within this theoretical framework, contributors from Europe and the U.S. highlight the dynamic and creative aspects of school, family and community practices and the dramatic aspects of child development in our changing educational institutions. They also use a series of original empirical studies to introduce different research methodologies and complement theoretical analyses in an attempt to find innovative ways to translate cultural-historical and historical anthropological theory and research into a thorough understanding of emerging phenomena in school and after-school education of ethnic minorities, gender-sensitive education, and educational and family policy. 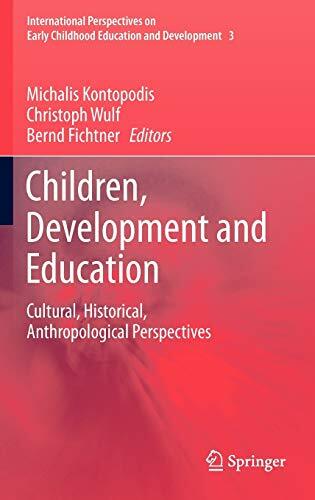 Divided into two main parts, "Culture, History and Child Development", and "Gender, Performativity and Educational Practice", this book is useful for anyone in the fields of cultural-historical research, educational science, educational and developmental psychology, psychological anthropology, and childhood and youth studies.